Next week is a busy one. Put these dates on your calendar now. Tuesday, Sept. 12: It's primary day. Local elections are important. If you're a Democrat, get out and vote. To find your polling site, click here. To learn more about who is running, click here and here. Wednesday, Sept. 13: Comedy Night! We could all use a laugh. 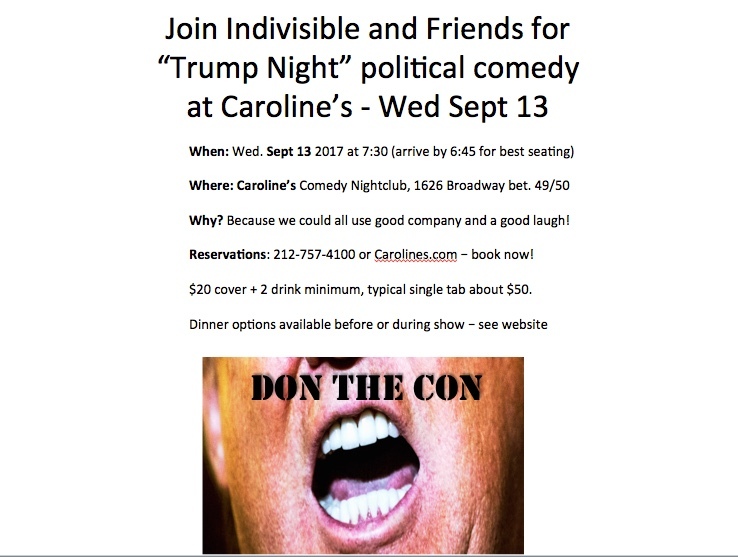 Make your reservation now to join Indivisible UES and friends at Caroline's. Thursday, Sept. 14: Indivisible UES monthly meeting. 8:15 p.m. - 9:30 p.m.
With an announcement about the fate of DACA imminent, Movimiento Cosecha invites immigrants and allies to join its mass demonstration in front of Trump Tower. (You don't have to be there the whole time. Drop by on your lunch hour.) Other resistance organizations are preparing to join if/when the DACA repeal is announced. To learn more about the DACA program, click here. Take the DACA Repeal Action pledge here. Starts at New York Public Library at 42nd and 5th. Ends at Sen. Schumer's and Gillibrand's offices at 48th and 3rd. Rise and Resist says: "Our senators are going back to D.C. on the 6th, so we're having a 'Back to Work' send-off to urge them to make healthcare available and affordable for everyone. We will have giant lunchboxes filled with people's ideas on how to improve healthcare in the U.S. Leave your ideas on this page and we will include them in the lunchboxes!" Ahead of next Tuesday's primary, Common Cause and Rock the Vote are organizing "Get Out the Vote" phone banking. Sign up now so that you can participate in the next few days. Training will be provided. Indivisible Houston has links to helpful organizations. ColorLines has a list of charities that specialize in assisting communities of color. The nonprofit Charity Navigator functions like a Better Business Bureau for charities, enabling you to choose organizations that will use your money wisely. The GOP tax reform plan is a scam. Go to the Indivisible Guide's Trump Tax Scam website to familiarize yourself with the issues. We will be contacting our members of Congress about the Republican tax agenda, so you will need to be informed. Disclaimer: By choosing to attend any of the events listed here, you are acknowledging the risks involved, and you are committing to participate nonviolently and in accordance with the law, and to work to de-escalate confrontations with opposing persons or others. You agree (i) not to engage in any act of violence or violation of any applicable law and (ii) to obey the orders of authorized event marshals and law enforcement authorities.